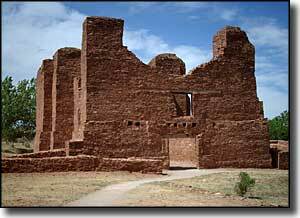 Salinas Pueblo Missions National Monument contains about 1,077 acres broken into three widely-separated parcels. These were Tiwa- and Tompiro-language speaking pueblos when first discovered by the Spanish in the early 1600's. The Franciscan missionaries who accompanied the Spanish explorers felt these pueblos were particularly ripe for their missionary efforts. However, as was often the case when Europeans first came together with Native Americans, the spread of European diseases wiped out large numbers of the indigenous population. Then a long-term drought set in and finished the job. By 1680, the entire district was depopulated of Native Americans and Spanish settlers. What remains today are the ruins of the mission churches at Quarai, Abo and Gran Quivira and the partially excavated pueblo at Gran Quivira. The Gran Quivira site was designated as a national monument in 1908. The other two sites were New Mexico State Monuments until they were absorbed into Gran Quivira in 1980. The whole was renamed in 1988. 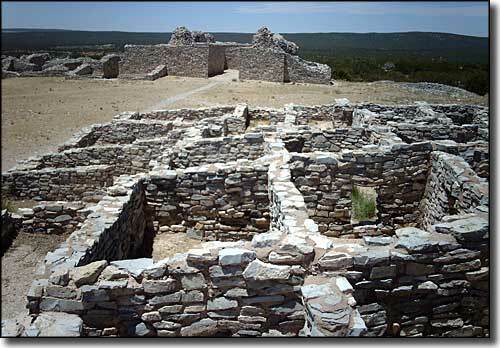 The northernmost set of ruins is at Quarai, about 8 miles north of Mountainair near Manzano. There is a visitor center on-site and a half-mile trail through the ruins. The Abo ruins are above Abo Pass, about 9 miles west of Mountainair. 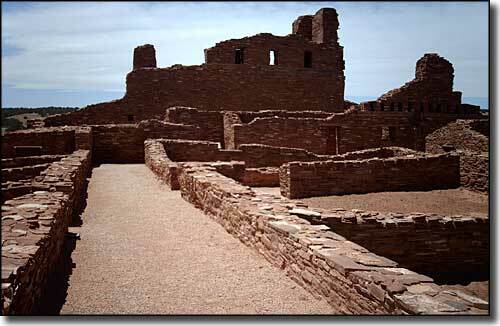 At Abo there's a visitor contact station with a quarter-mile trail through the mission ruins and a half-mile loop trail around the ruins of the unexcavated pueblo. The Gran Quivira ruins are the most extensive. 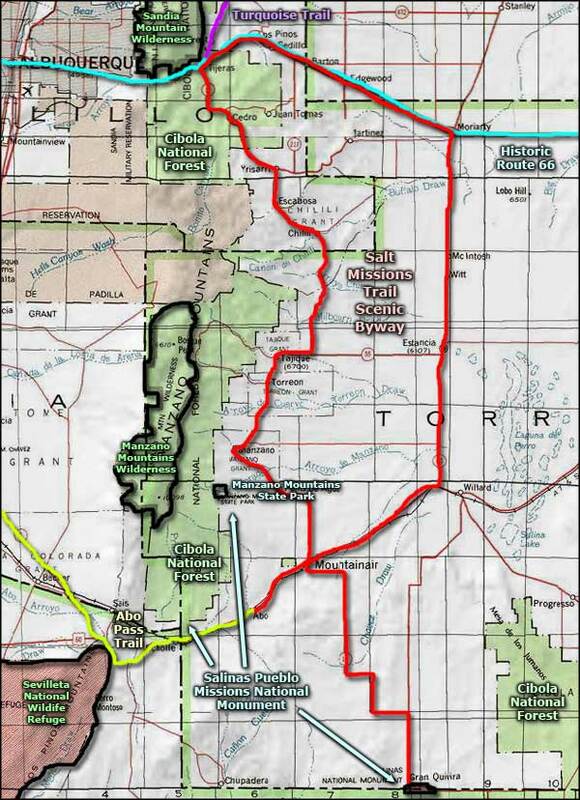 They are located about 25 miles south of Mountainair. Near the parking lot is a small visitor center. From the visitor center a half-mile trail leads through the partially excavated pueblo ruins and past the ruins of the uncompleted mission church. Salinas Pueblo Missions National Monument is open daily except Thanksgiving Day, Christmas Day and New Years Day. Winter hours: 9 am to 5 pm. From Memorial Day to Labor Day: 9 am to 6 pm. The properties are day-use only, no camping is allowed. There are also no admission fees invoved. The Salinas Pueblo Missions National Monument primary visitor center is located in Mountainair. Photos are courtesy of Wikipedia userid Nationalparks, CCA ShareAlike 2.5 License.